JT Hughes Group is an official franchise for Honda, Hyundai and Mitsubishi in Shropshire & Powys. When they contacted us, their company’s website was outdated compared to the more developed bricks-and-mortar part of their business. Significant changes in the operating environment and within the auto retail ecosystem challenged but excited JT Hughes on the potential digital could bring to the table. They saw an opportunity, for the first time, to not only build a relationship with the customer by leveraging connected vehicles but also to deliver a rich brand experience through seamless integration across all customer-facing channels starting with their website. The management team at JT Hughes Group chose Built For Now to update the design and support front & backend development. All prices, dates, and other information presented in the case imagery are placeholders. There is no connection with past or ongoing campaigns. We like to keep our customers at the heart of what we do, that’s why I was interested in user-centered design. We wanted to present a viable business case to improve the user experience on our website and optimise customers expectation and needs which included feedback from our customers. The customer input was painful to hear but proved invaluable. Generally, user experience in automotive industry websites is bordering on absurd. A radical approach was required. The user experience design needed to do what it’s supposed to do. The less our customers have to think about the interface or design, the more they can focus on accomplishing their goal on our website. Built For Now brought a wealth of knowledge and methodology to the project and provided the ‘user-first’ focus that we wanted. As specialists in user experience design, their guidance through the audit, the workshops, the wireframes, the physical design and then the test of the design, helped to drive the project along efficiently. The Home page – Don’t sell, help! "Automotive Dealers cannot predict customer intent when they first land on the homepage"
The purpose of JT Hughes's homepage is to maintain their customer's 'browsing momentum'. We knew from customer feedback and mining the data the intent is divided into 2 macro-actions. Customers who wanted to purchase a car. Customers who want to book a service. Featuring irrelevant content and offers on the homepage was halting this momentum, and the bounce rate confirmed this. We removed all offers and displayed sign post content that matched their intent. We wanted to make sure the search process was simple, intuitive and fast particularly if the customer was searching on a mobile device so opted for a step-by-step approach. Most visitors, new or returning, know JT Hughes is a Honda, Hyundai and Mitsubishi dealer and, which brand and model they're interested in buying. 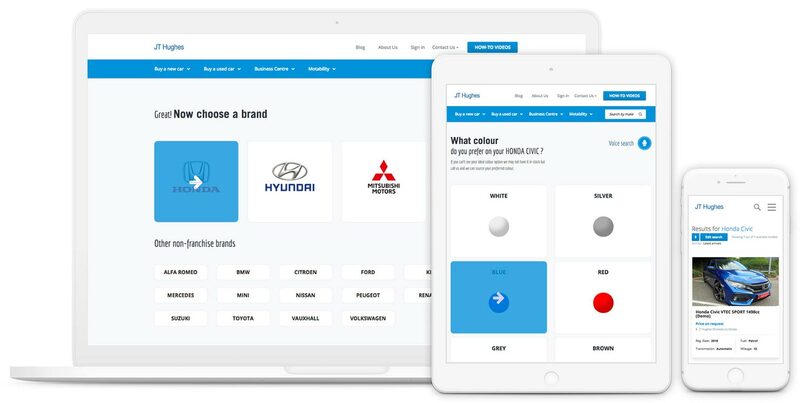 We removed anything that does not contribute to the search process on each page, so users could focus on what vehicle they are searching for with no distractions. We also limited annoying drop-down menus and replaced them with big, bold buttons, and microcopy prompts. Each decision, such as choosing a brand or a model, gets a full-screen treatment. Users "unlock" a new screen with each action they take. 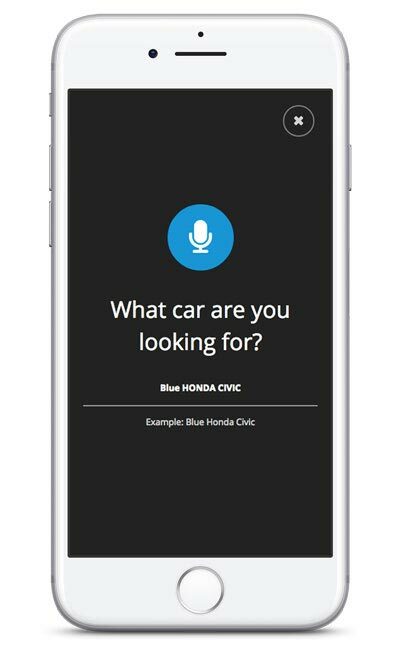 Search for your car using your voice. With the introduction of Web Speech API to Chrome and Firefox, we trialled a car search triggered by voice command. Offering voice search would improve accessibility, especially for those with physical disabilities but it can also substantially reduce the time it takes for potential car buyers to find a specific vehicle with zero clicking required. Not all browsers support the feature, but we know its gaining in popularity and wanted to test voice search in a 'live' environment and refine the function when the API is available on other browsers. Disclaimer: Voice search volume stats taken from October 2017 to July 2018, Google Chrome and Firefox only. 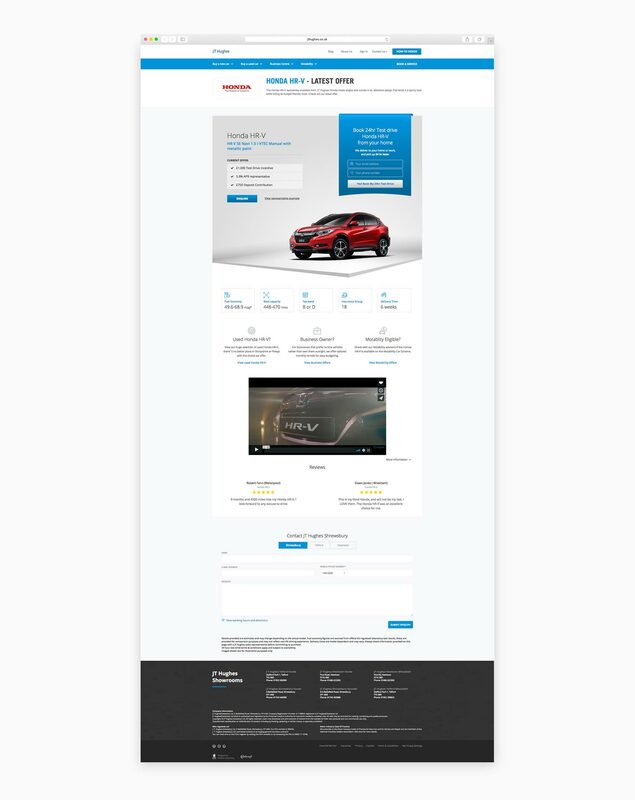 In their purest sense, new car model pages are lead-generation pages, and we wanted to offer one choice and one choice only – either to take a specific action or to click through the page. JT Hughes's previous new car model pages tried to accomplish too much. Our goal is to have visitors book a 24-hour test by filling in a short form, and all elements on the page should contribute to accomplishing that goal. "The team at Build For Now were incredible to work with! They partnered with us to develop our website and digital marketing strategy & they're one of our most important suppliers. Great energy, highly collaborative, and awesome output." 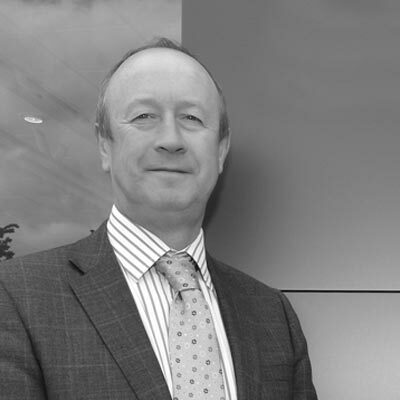 Managing Director JT Hughes Group. The main project challenges were stringent deadlines and working with a legacy automotive mindset which started by promoting offers rather than focusing on the customer experience. A rapid prototyping methodology was adopted to simulate the most vital aspects of the user journey and help the JT Hughes marketing team to understand better the end users experience without it being fully functional. We used Invision for design collaboration. Our team used it for prototyping, providing results, and getting feedback. It served as an agile board where all participants could see recently uploaded results, comment, and download all the necessary design assets for development. After a couple of months of hard work, we got buy-in and approval for all the significant changes to the interactive prototype. Subsequently, the design team & developers took over, which allowed them to proceed further in a more planned fashion. The project lasted about 6 months, during which we did a lot of user testing. After completing the tasks assigned to us, we launched and tested the changes in a 'live' environment. To this day we continue to follow a Growth Driven Design methodology (GDD) for the JT Hughes Group. Growth-driven design succeeds in minimising the risks of traditional web design through a systematic approach that shortens the time to launch by focusing on real impact, and continuous learning and improvement. GDD focuses on iterations, or “sprints,” for shorter timeframes (which are less risky and less costly).